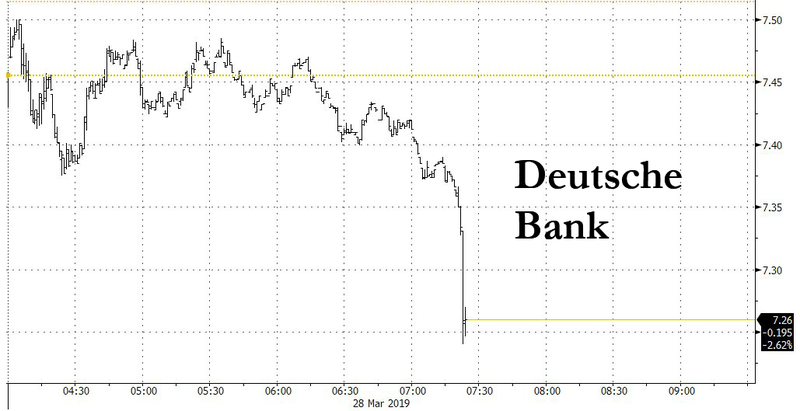 Deutsche Bank shares sank on Thursday after the Financial Times reported that the troubled German lender had been discussing tapping equity markets to raise as much as €10 billion ($11.2 billion) in what would be the bank's fifth return to the equity well in under a decade. At the higher end of the range, the raise - which would help facilitated a "merger of weakquals" with fellow struggling German lender Commerzbank - would be equivalent to roughly two-thirds of Deutsche's €16 billion market cap, and about 40% of the combined market value of Deutsche and Commerzbank. According to the FT, the German government, which has reportedly been pushing for a tie-up between the two banks to create a new German "national champion", would like the bank to raise as much money as possible before a merger to prevent the combined bank from returning again to the capital markets. However, DB's managers are reportedly resisting this because they would rather keep any capital raise on the lower end of that range to try and appease shareholders anxious about the economics of the merger. Estimates for an expected capital raise have ranged from as little as €3 billion, to an amount equal to the bank's current market cap of roughly €16 billion. Yet, in a statement to the FT, Deutsche said it was too early to determine whether it would need to raise outside capital. Deutsche Bank told the Financial Times in an emailed statement that it was "much too early at this stage of the due diligence process to make a credible assessment if there is any potential capital need at all." The German finance ministry declined to comment. Despite a flurry of reports to the contrary, Germany's finance minister denied in an interview this week that he was pushing for a tie-up. In an interview with Frankfurter Allgemeine Zeitung published on Wednesday, finance minister Olaf Scholz denied that he was pushing for the tie-up. “I am not in the driver seat”, he said, adding that the decision was up to the banks. One shareholder who spoke with the FT under the condition of anonymity said that if DB did need to raise the full €10 billion, then the Commerzbank tie-up "would not be a good deal", and that they would likely oppose it. Unfortunately, an analyst said that it's becoming "increasingly clear that a merger wouldn't work without a capital increase." Though the government (which is Commerzbank's largest shareholder) has reportedly lobbied hard for the merger, critics have argued that, other than some cost-savings due to operational "synergies", there was little benefit to combining DB's toxic assets with Commerzbank's toxic loan book.